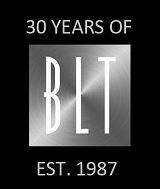 2017 marks BLT’s 30th year in business! We’ll be no doubt getting out the party hats and partaking of the occasional glass or three of champagne throughout the coming year, but it’s worth pausing for a little nostalgic reflection on the past three decades – such longevity isn’t exactly the norm in the world of recruitment! When we were founded by Mssrs Beament, Leslie and Thomas all those years ago, the aim was to provide ‘inch-wide, mile-deep’ specialist knowledge of the recruitment markets we operated in; we wanted to be the recruiter of choice in our specialist markets, and we wanted to be known as good people to do good business with. Those values remain to this day and we find the BLT of today remaining at the top of the game in all matters related to Indirect Tax & Management Consultancy recruitment. 2017 will be remembered for shock results (cf. the Brexit referendum here in the UK, the surprise Trump presidency etc etc) which has resulted in a general sense of uncertainty in many quarters. However: looking back to when BLT was founded back in August 1987, a few months later ‘Black Monday’ on Wall Street happened – £50 billion wiped of the value of shares on the London stock exchange. Whilst we’re sure there was no link (or was there?! ), we’re well used here to expecting the unexpected. Having lived through a number of recessions as well as taking advantage of those market upturns as and when they happen, there’s not much that fazes us round here at BLT! A quick glance at the well thumbed ‘placement book’ from ’87 sitting proudly on a shelf at BLT towers (and held together by yellowing Sellotape), sees appointments in Tax and Consulting on salaries between £11,000 and £24,000 – these days recent BLT appointments have ranged between £25,000 and £200,000! The other thing that immediately strikes you is the range of accountancy firms recruiting: Arthur Andersen, Arthur Young, Binder Hamlyn, Coopers & Lybrand, Ernst & Whinney, Grant Thornton, Hays Allen, Moore Stephens, Pannell Kerr Forster, Peat Marwick McLintock, Price Waterhouse, Spicer & Oppenheim and Touche Ross all took staff on from BLT in those early months – what it must have been for a candidate to have so much range of choice! Lovely to see that all those early clients back then are still our clients of today (albeit in rather changed forms post a zillion mergers/acquisitions!). On the corporate front, British Gas and Prudential hold the honour of our first ‘in-house’ placements – these days our work is split much more evenly between corporate in-house appointments and the professional services firms, with key recent clients including the likes of Amazon, Bloomberg, BP, Burberry, GSK, Legal & General, Liberty Global, Samsung, Thomson Reuters etc etc. Our work has taken us beyond the UK borders too – we’ve worked in Australia, Bahrain, China, Czech Republic, France, Germany, Guinea, Hong Kong, Hungary, Ireland, Italy, Kenya, Malaysia, The Netherlands, New Zealand, Poland, Romania, Russia, Singapore, South Africa, Switzerland, Tanzania, Thailand, United Arab Emirates and the USA. 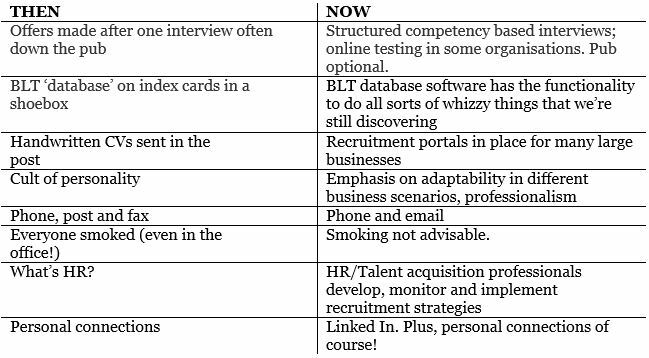 So what else has changed in the world of recruitment since? In the last three decades, BLT have gone through 3 offices, the retirement of the three founders and employed a mere 75 recruiters and 22 support staff. Looking at the current BLT gang, the average length of tenure here at BLT is just over 12 years – unheard of in the world of recruitment! Some highlights from the Management Consultancy team: the first recruitment firm to specialise in the recruitment of Management Consultants; consistent winners of team and individual awards in the annual Top Consultant Recruiter awards; assisting the Big 4 to build specialist consulting practices, partnering with boutique and niche consulting firms to establish their brand; introducing fast stream Public Sector individuals to the growing Public Sector consultancy market in the 80/90s; recruiting individuals from all walks of life into strategy consultancy; supporting a range of corporates as they look to build their own in-house consulting capability; extending our reach to the international market. And from the Indirect Tax team: Identifying Indirect Tax as a niche field in its own right separate to the rest of the tax profession; helping those early Indirect Tax pioneers move into the private sector in the late 80’s; establishing in-house Indirect Tax functions in the 90’s and working with the large accountancy firms on setting up the graduate training programmes at the end of that decade; working in Australia on GST implementation at the turn of the Millennium; giant growth of the Indirect Tax profession in the 00’s and adapting to the increased scrutiny on Indirect Tax compliance post Enron and Sarbanes Oxley; technology advancements in the last decade and currently Middle East VAT implementation and being poised for the growth of the Customs & International Trade market in the run up to Brexit. We’ve worked hard to remain consistently relevant in a rapidly evolving recruitment landscape, one such example being the addition of our new Executive Coaching Division. I’ve just typed in ‘longevity’ into an online thesaurus, and it came up with some dubious results such as ‘old age’, ‘lifetime’, ‘endurance’ and even ‘dotage’, so I won’t be using THAT online tool any more. Typing in ‘constancy’ comes up with more cheerful synonyms: ‘dependability’, ‘trustworthiness’, ‘loyalty’, ‘tenacity’, ‘determination’, ‘integrity’…all these sum up what BLT has been all about, we feel. We’d like to say a big thank you to all those we have worked with over the years, whether as clients, candidates or former colleagues. What great fun we’ve had on the recruitment rollercoaster, and we look forward to keeping our recruitment offering as fresh, relevant and agile as it was back in the day.